Speaking Your Brand was created to provide coaching, strategy, and support you need to take your story and your craft and turn it into a compelling message, whether it’s web copy or a presentation, that provides immense value to your audience. 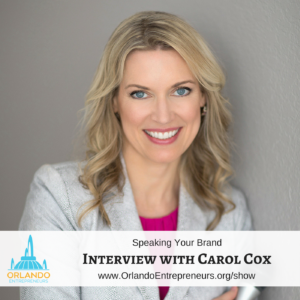 Carol Cox is the founder of Speaking Your Brand, which helps high-performing, purpose-driven entrepreneurs and professionals create their signature talks (keynote, TEDx, business presentation) to grow their business and become recognized as influencers in their fields. Carol is a pod-caster, speaker, and sought-after presenter and trainer on public speaking, business storytelling, and women’s leadership. Carol teaches business and marketing classes at Full Sail University and during an election, seasons serves as a political analyst on TV news. Prior to Speaking Your Brand, Carol founded and ran two software businesses, whose clients included Fortune 500 companies, small businesses, community organizations, and political candidates. Carol holds a Master’s degree in History from Emory University, where she was a recipient of the Javits Fellowship for graduate study, and she graduated Phi Beta Kappa from the University of Florida with a Bachelor’s degree in History.